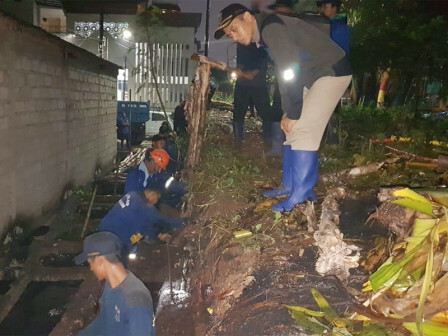 Pinang PHB channel's retaining wall repair on Jalan Niaga Hijau, Pondok Pinang Urban Village, Kebayoran Lama, South Jakarta that has been collapsed on Monday (12/3) is currently installed with cerucuk dolken (piles of certain woods) to prevent it from collapsing again.
" We don't repair it permanently because there is permanent building built above this channel"
South Jakarta Water Resources Sub-dept. Head, Holi Susanto mentioned, it is immediately repaired after retaining wall collapsed.Retaining wall's height is around 3-5 meters and it has been collapsed along 15 meters. "It is included as public facility land and submitted to Jakarta Government. There is PAUD built on this land and it is located near the channel," he said, Wednesday (12/5). Meanwhile, South Jakarta SDA Sub-dept. 's Maintenance Section Head, Firmansyah explained, his side deploys 15 personnel to install 100 cerucuk dolken thus the work can be finished faster. "We don't repair it permanently because there is permanent building built above this channel thus it could be dangerous to do it. After we control this building, then we can repair this retaining wall permanently," he stated.